Carlos Barbosa is a rally chief with two hats. 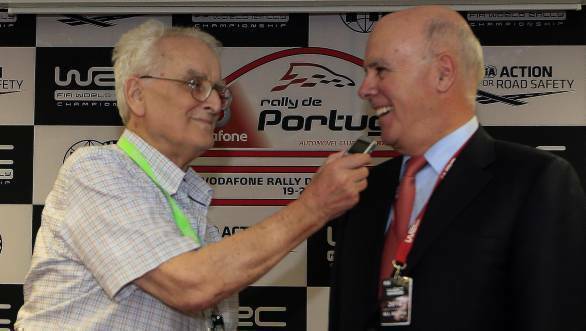 At home he is the President of the Automobile Club of Portugal, internationally he is the FIA's President of the World Rally Championship Commission. Portugal's premier rally has been changing its face these days. Their world championship qualifying event is again based back in the north of the country, the region considered its spiritual home for the second year, after a decade of being held in the south of the country. Before this year's event took to the streets we asked Carlos why the rally ever went down to the Algarve, when it had been so popular in the north. CB: When the rally came back to the world championship in 2007 we didn't have the commercial support of the authorities in the centre of the country. We had to go to the south because we had the support of the Tourism of Portugal to do that. They wanted to promote the south because it is much more popular tourist part of Portugal where are the beaches, the golf courses and everything. So we went there and were very well received. It was ideal for us because the stages were fantastic and the local authorities ensured the work was very well done. We had good hotels, we had everything. Then after seven years the FIA said they want the rally to be seen by more spectators than was possible in the Algarve. The north is the "home" of rallying in Portugal, like we saw last year when the event attracted 1.5 million people over the weekend. It was fantastic. So we come back to the home of the rally. We are already working on developing the theme for 2017. MH: Where will the rally be based in the future? CB: We are thinking of starting the 2017 rally in Arganil, then use the stages up to Porto. If we use the Arganil area just for the first day of the rally, there will be no available infrastructure problem. There is now good sport for this concept. Two or three years ago, Portuguese Tourism said they didn't want to support rallying any longer as they only wanted to support golf and beaches. That was worrying but our new government is now studying again the situation. The new Secretary of State said the support of the rally had worked very well in the previous governments. She well knows the power and the money the rally brings. And she's hoping to revive their official support again next year. MH: Putting on your FIA hat, things are changing internationally as well. How happy are you with the way the 2017 new WRC formula, is developing? CB: I'm very happy, because I know that the new cars have been tested for some time. I think the new cars will be very impressive. They will be much faster, beautiful, stronger. For the fans they will be more like the old Group B. We are very happy with the return of Toyota. It will be a very good championship. MH: A lot of people are very nervous about the increased performance, particularly when thinking about security. CB: I think there is no reason for that. Look at how the experiences in Argentina were handled, for example. Last year it was an example of bad security. This year they made a fantastic job. Michele Mouton (FIA's safety delegate) is making a very good job. She often goes two or three weeks before each rally to make sure everything works. This was done in Argentina to help overcome their problem controlling the crowds, now we are working with Poland which is the next one we must check. So I'm not worried on this aspect. MH: The arrival of the 2017 cars means there will in effect be one more formula of rally cars in the sport. What will happen for the then redundant 2016 World Rally Cars? Is there an opportunity for a new championship, maybe for example a Privateers' Cup, for the present generation cars? CB: We are studying this because I think that the world rally championship should not only be for the manufacturers. We want to give privateers the chance of winning a title so they can be recognised like the manufacturers are. The (World Rally Championship) Commission can see there are now so many privateers in the championship appearing in the championship events with R5 cars. We are seeing what we can do for the privateers. Regarding the future of 2016 specification World Rally Cars we are studying this with our technical department. We do not want these cars to be left behind in the garage. It is not our proposal to abandon these cars, we want to see more and more cars on the rallies, more people making rallies. MH: What is going to happen about all these new rallies wanting to be in the WRC? Can we expect the FIA to go back to a Rotation system for events? CB: Yes, there is a lot of enthusiasm from new countries. Jordan, Brazil even at one time Iran. There are many countries that want to have a rally in the world championship. We are studying proposals. Of course we cannot have them all in the series! Many countries want to enter the WRC because they see how our television coverage has changed completely in the last two years and they know their countries can be seen by millions and millions of people. MH: Finally, are there any other new initiatives, new ideas, which are developing at the moment, which you hope will come to fruition in the future? CB: Yes, we have some but I cannot tell you. We are due to discuss them on 24 May on the Commission to see what is going to do to make the championship more exciting next year.